An imam's stabbing leads to soul-searching among Bradford's Muslim and white British community. Zac (Matthew Thomas) is a child of an Islamophobe mother and an unemployed father. He is driven by hate and confusion to stab the leader of a nearby mosque, who had in fact argued for greater inclusivity. This incident leads the imam's son to question his faith, and also affects a young Muslim woman who is studying Politics at the University of Bradford. There are so many problems in Freesia it's hard to know where to begin. Really the greatest of all the terminal issues is the dialogue, which is basically a GCSE essay on why Islamophobia is bad, copied and pasted into a script. The 'characters' led me to metaphysical musings on whether there can be less than one dimension, categorised as they are as bad white people, good white people, sensitive Muslims, and less sensitive Muslims. None of the plot points are believable, notably a police force that treats an attempted murder with close to zero urgency. Everything in Freesia is only an attempt to make a belaboured political point, let down by the ludicrously Dickensian portrayals of working-class Bradford and the portrayal of a city where Muslims are being assaulted every time they leave the house. Subtlety is a foreign concept throughout. Visually, the film is barren. It is almost all medium shots of people talking, to the point where Freesia may as well be a radio play. The score is dull until it becomes pathetically melodramatic, and I would also call the acting dire but I don't think Laurence Olivier could have done much with the script. Freesia uses HD cameras and no make-up department, brutally exposing the acne of Yusuf (Aqib Khan) in several scenes. Another character is unnecessarily shot from below in one scene, showing off how overweight he is. This whole thing could be worthy of Tommy Wiseau if it were an outright vanity project or consistently amusing. However, one key dramatic scene between Zac and his parents is rendered unintentionally hilarious as the heads are cut from frame and the bodies get into a frenzied argument. The film is dedicated to Mohammed Saleem, who in 2013 was murdered in Birmingham by a Ukranian white supremacist. 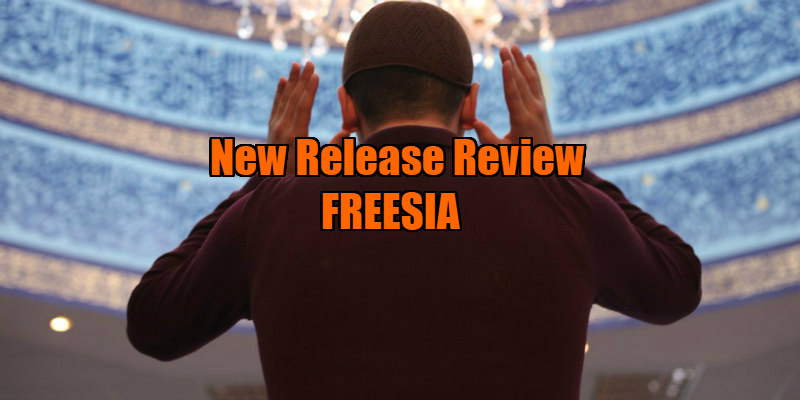 With further recent events such as the terrorist attack outside Finsbury Park mosque, Freesia had the opportunity to be a timely and important film. Instead, it's a grandstanding mess, encouraging any bored viewer to deconstruct and mock when they should be thinking about wider issues or even confronting their own prejudices. I am not sure what staff at Airedale Hospital, where scenes were filmed, would make of a stabbing victim being left alone with his son to die. Of all the ridiculousness in Freesia, this ranks somewhere in the middle. Perhaps the most egregious moments are left for the 'finale', as a recently veiled Khadija (played by Afsaneh Dehrouyeh, the reasons for her character's decisions so contrived as not to be worth getting into) debates with yet another generic white Islamophobe. Islamophobe: There's nothing wrong with hating people. Khadija: Well get in line, I've had a busy week. Islamophobe: If I had my way, all you lot would have a one-way ticket out of here. This exchange should give you an idea of what watching this film for its 90 minutes runtime will provide. I actually felt less informed about the complex issues supposedly confronted after viewing. There are noble intentions aplenty in Freesia, which makes it such a shame that this is a truly atrocious film. I do feel for the schoolkids who are inevitably forced to watch this. 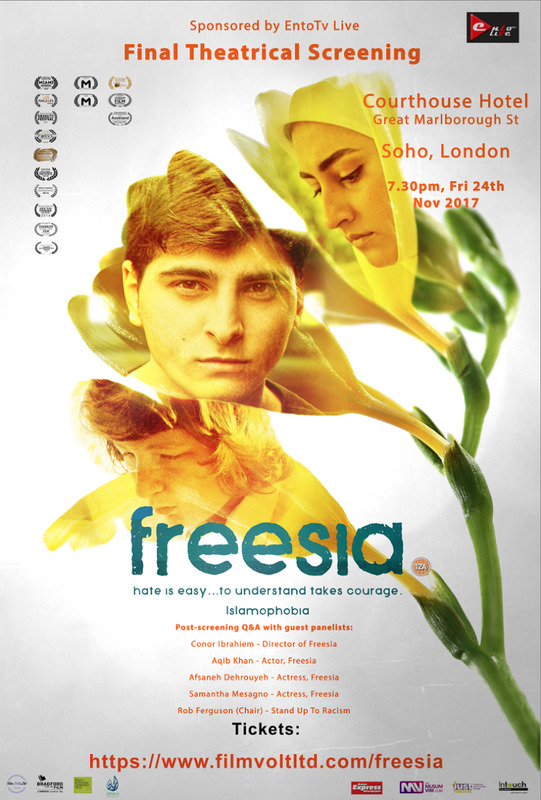 Freesia will have select screenings in UK cinemas during November, followed by a DVD/VOD release in 2018. Visit arakancreative.co.uk/freesia-film for more info.